I see a Seriously Absurd restaurant COMMING SOON to Mt. Dora! Here are a few name that might reflect its celebrity chef’s tastes: “The Brewseum” or “Pour Jusgement.” Or, if you’re in one of your Middle Earth moods, hows about “Lord of the Wings”? Hey TL … None of the above … if and when I should ever lose my mind to the degree that I would open a restaurant, it would have to be “Kale, Kale the Gang’s all here!” Plus it would never ever serve kale. Haha, Richard! Now I am going to have to fix up a bucket full of kale chips to munch and gag on during the Super Bowl. Better than starving! Hi Lee … Thanks a bunch of kale for reading … The fact is I enjoy the flash fried kale I had once at a restaurant … but I think it was the fat and salt that was the real appeal! I’ve tried the kale chips and since the makers try to be healthy, they don’t use enuf fat … or salt to make them edible ,,, so, that’s a no go! This year, kale chips were more inviting than the Super Bowl … and that’s a real seriously absurd problem! 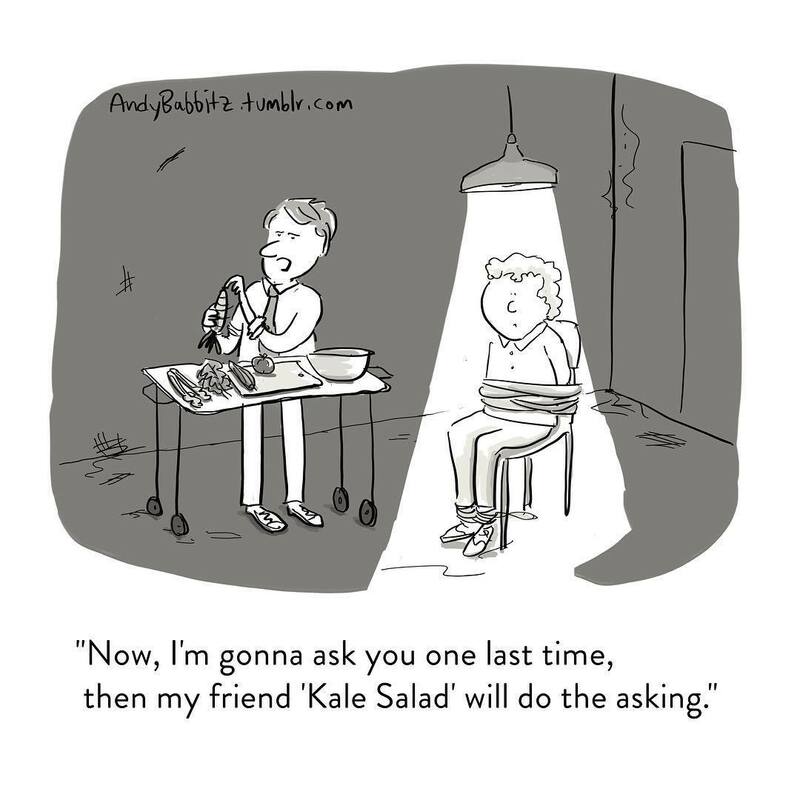 You really have to go back to your kale aversion therapist and let it go !!! From my point of view you would have tear my kale avocado cricket burger out of my cold dead hands. Hey Michael … I see you now in your Planet of the Apes costume mimicking Charlie Heston … or maybe it’s in your Ben Hur toga … with your 8 oz kale-cricket burger raised above your head! And, it’s not a pretty picture … but I do appreciate your support and your clever Biblical/Scifi reference! I’m with you on this one! I’m just not buying kale in any sense. I read that some think of kale as mainly offering a break from spinach. To me, that’s kinda like replacing lean ground chuck with slightly rancid and fatty ground beef – YUM! Hi Mike … thanks for reading and commenting … good point re: ground beef … nowadays you risk eating “left over red stuff” whenever you buy ground beef in a supermarket … pink slime’s the name of the game … near beef … almost cow. Just remember … Popeye got his strength from plain old canned spinach … no kale crossed his salty lips! When I was growing up we lived in a subdivision that was built on an old farm about 1925 — all the lots but one were built on. The one ‘extra’ lot was kept mowed by the neighbor next door; then, she died and the lot was allowed to overgrow. Hey Janie… from lowly “weed status” to the loftiness of a health food” … the Cinderella Story of Kale … sounds like a Disney production … most of our fetish for “greens” follows the same story line you told for kale … mustard, collards, cabbages … only for the poor folks. Richard, it’s clear that you have completely misunderstood the role and uses of kale. No other food requires as much chewing, except perhaps the overdone Sunday beef roasts of my dear departed Southern mom. So, it’s an excellent exercise for “jawboning”, which I would have expected you to appreciate. And where did you get the idea that one was meant to swallow kale? It’s like fine wine that you “chew and spit”. The healthy anti-oxidants are absorbed through the lining of your mouth so there’s no need to force your poor single-stomach digestive system to ruminate over the cud. Leave that to cows who come properly equipped with the double tummy to handle it. So perhaps there’s a new use for the spitoon!